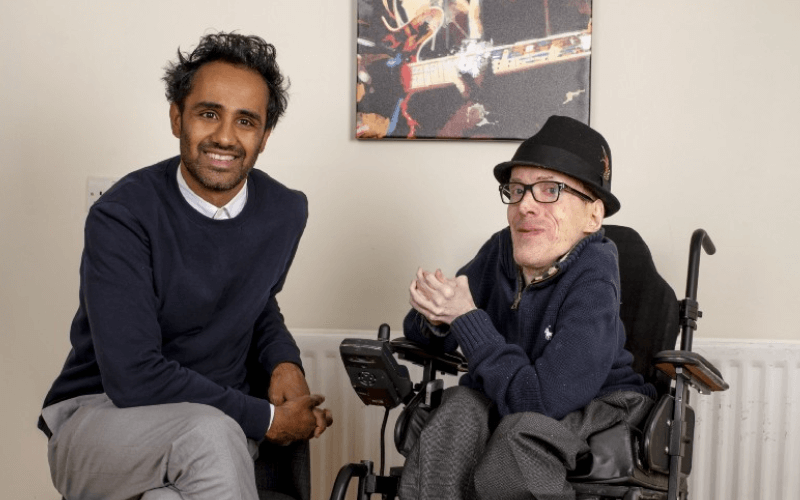 A disabled journalist is calling for action to address widespread discrimination in the media industry after a news agency told him he had not been interviewed for a job because he did not have a qualification in shorthand. Declan McSweeney has tried several times to apply for posts with Mercury Press in Liverpool – and with other news organisations – and has been told on each occasion that he was not suitable for the role. But on the last occasion the agency admitted that the experienced journalist would not be considered because he did not have a recognised shorthand qualification. 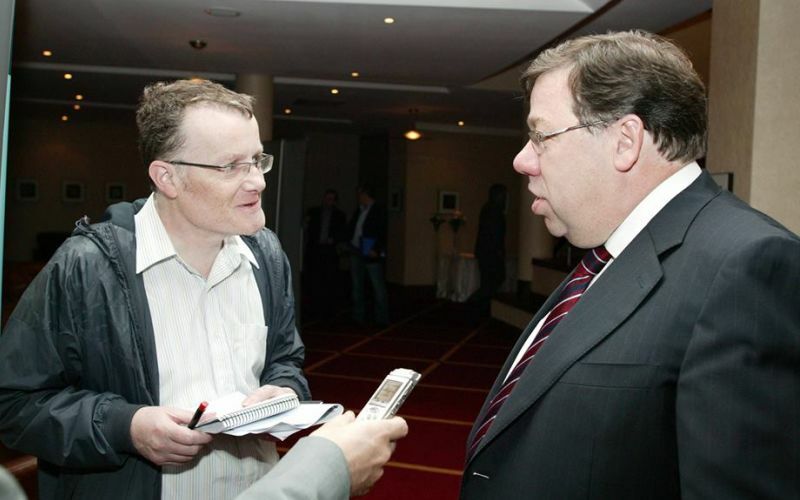 McSweeney (pictured, interviewing former Irish Taoiseach Brian Cowen), who has cerebral palsy, has previously worked as a journalist in Ireland and London for more than 20 years, and has his own system of shorthand that he has used successfully throughout his career. But he was told that this would not be acceptable for the Mercury position. A senior executive for the agency, which is owned by Birmingham-based Caters News Agency, told him in an email: “To follow up your comment about it not being mandatory to be qualified in shorthand. “We have never once stated that you could not get a job with another company without this qualification, rather it is our own company policy to require any applicant to have this. He also threatened to call the police if McSweeney persisted in complaining about the way he had been treated. After Disability News Service approached Caters for a comment and asked why it had apparently refused to make a reasonable adjustment for McSweeney under the Equality Act, it claimed its comment about shorthand was “a human error mix-up our end”. Chris Dyche, co-owner of Caters, said: “I have written to Declan explaining everything and setting the record straight, as he had been given incorrect information, unfortunately. “We don’t discriminate against anybody. We haven’t on this occasion or any other occasion. Caters had not confirmed by noon today (Thursday) what reasonable adjustments it would make to another disabled journalist in McSweeney’s position. Dyche also apologised to McSweeney and told him in an email that he should not have been told that his “lack of a formal shorthand qualification is the reason why you have not been selected for interview” because the company had “quite a number of people who work for us who don’t have a formal shorthand qualification”. He said the reason he was not given an interview was that his past experience had been in the wrong areas of journalism. McSweeney previously worked as a journalist for more than 18 years with the Offaly Express in Ireland, which has now closed, and in London for the Romford Recorder and as a sub-editor with Associated Press. After he was made redundant by an Irish company in the wake of the global financial crisis of 2008, he returned to the UK and attempted to re-enter the industry but has been unable to secure any employment as a journalist. He believes this is partly due to age discrimination – he is 58 – but also because his impairment means he cannot achieve a recognised shorthand qualification. He believes this discrimination is widespread and points to the case of Kyle Gunn, a journalism student with cerebral palsy, who was originally told that he would fail his course because he would not be able to pass a shorthand exam. Following outrage over the case, the Scottish Qualifications Authority agreed to start offering a separate journalism qualification that did not require shorthand. McSweeney said: “I feel that Mercury/Caters need to ensure that their advertising in future contains no reference to 100 words per minute shorthand, because even if they do have journalists who don’t have a shorthand qualification, their advertisements have been specifying it, and staff there told me it was a requirement. “However, this is a much wider issue than one company. “The Kyle Gunn case underlines how endemic discrimination on grounds of disability is, and the failure of editors generally to grasp that insisting on shorthand is discriminatory because there are many of us who could not get a shorthand qualification if we studied for it for one million years, due to a condition we were born with. “I am aware, for example, of a deaf woman who was unable to pursue a journalism career because of the shorthand requirement. He said a further problem he faced was the failure of the regional media in Britain to recognise the validity of experience in Irish journalism, when British journalists are frequently and successfully employed by Irish media. The National Union of Journalists (NUJ) declined to comment on the shorthand issue. But an NUJ spokeswoman said: “News organisations must make the necessary adjustments for disabled media workers so they can play their full part as journalists. “The NUJ campaigns for equality and improved diversity across all sectors of the industry.